The SPA Shower Filter has an approximate lifespan of 15,000 to 20,000 litres of water, depending on the amount of chlorine found in the local water source. Calculate approx. 5 litres of water per minute of showering. 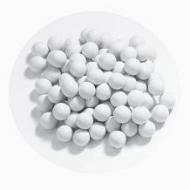 The SPA Shower Filter includes 2 different filtration media: calcium sulfite (white flakes) and ceramic balls (see images). 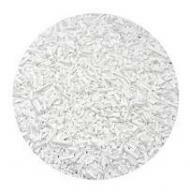 It is time to replace the shower filter media when there are no more calcium sulfite flakes left. To replace the shower media, simply unscrew the cap on the back face of the filter, dump out the existing media (you should only have ceramic balls left), replace with the contents of the SPA Shower Filter Repacement Media package (calcium sulfite + new ceramic balls), and screw the cap back on. No housing is included with the SPA Shower Filter Replacement Media. The shower filter body should last for several years if used normally.